Clive Lloyd- I think when you look at our situation because cricket is the only sport which has been successful over the year. We have different islands with different cultures. We are spread out. Its tough to get people together and work in one direction. “Lot of guys played county cricket. Pressure on us was in 1975 in the World Cup against Pakistan there was pressure”. During that last wicket Lloyd drank 15 pale ales.When asked what he drank after the World Cup he just said it was ‘stronger stuff’. But in the 1983 World Cup India was a better team than us, they outplayed us and we just under estimated them. Allan Border- When Rajdeep Sardesai asked the same questioned Allan Border replied, “Pressure is probably more on host country.” Whether playing in India is more difficult than elsewhere because there’s little cheer for the visitors to this question He mentioned that extensive training camps in Chennai helped his side get accustomed to it. I remember talking to Azharuddin. We spoke about expectations and he said, Allan, tried being a Muslim and captain an Indian side. It got me the perspective and understand lot about the pressure. However domestic cricket in our country is also too tough, somehow that grooms us better to for world cricket. But there are times when I’ve lost my cool on field. 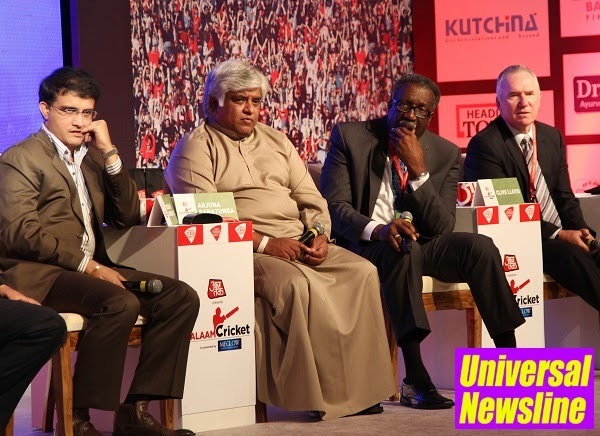 Arjuna Ranatunga- Sri Lankans are not as crazy as India. People are expecting us to win after the World T20 win. But i think those who can absorb pressure can win the tournament. That is the key factor. India was not good enough vs australia in 2003. I don’t get nightmares. We have won couple. You win some you lose some. Arjuna mentioned that nobody had expected them to do well. They were not expected to go to the semi-final. When asked about his cool on-field demeanour he smiles and tells that his colleagues won’t agree. It is all about how you cope that day. When you take the 1996 team i knew arvinda de-silva will perform. He was keen to excel. We knew that this time it was our last chance. The next tournament was in England and we knew we will not last till then. We had enough experience. We played better than Australia in the final.they were the better side. But we played well. Pressure should be there in sports. It makes players think. Pressure is something when you get used to it, and when you keep playing Test and ODIs for India it is tough. We went through lot of pressure. Every player has his zone. If anyone gets into that then it’s good for India. In 2003 World cup the whole team was under extreme pressure. The good thing about us is that we perform well under pressure, that’s why we are called a sleeping giant. While talking about him taking off his Tee-Shirt in Lords he said that, You make mistakes in life. It was one of them. We were Frustrated to have lost finals before that. It was just a beautiful mistake that he committed. The best mistake in my life was when i got married.